Russian Constitutional Court to resolve arbitration status | Russian Legal Information Agency (RAPSI). MOSCOW, May 23 – RAPSI, Sergei Feklyunin. 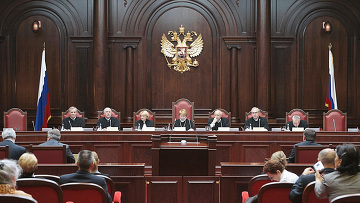 The Constitutional Court of the Russian Federation will announce its decision on the status of arbitration in Russia upon the Supreme Commercial Court’s request on May 26, the court told the Russian Legal Information Agency. Initially, the Supreme Commercial Court sent an inquiry to the Constitutional Court on whether arbitration permits the recovery of pledged property such as state commercial courts. However, according to the Supreme Commercial Court, the Constitutional Court’s decision could resolve a greater uncertainty, such as whether commercial courts are part of the judicial system or an alternative form of dispute resolution. The Supreme Commercial Court Presidium concluded earlier that the status of arbitration contains an ambiguity. On the one hand, the Civil Code, the Arbitration Code of Practice and mortgage-related laws do not make a difference between the commercial courts and arbitration when it comes to recovery of the secured real property. The presidium noted that, as defined by the Constitutional Court on June 4, 2007, arbitration is not included in the tribunal system and a commercial trial is a form of alternative civil rights dispute resolution. The issue was discussed at a closed hearing of the Constitutional Court on March 31. The results will be announced on May 26. Alexey Kostin, the chairman of the Russian Chamber of Commerce and Industry’s International Commercial Arbitration Court, said the decision may negatively affect some of Russia’s current agreements on international commercial and investment arbitration. 13:42 23/05/2011 The Constitutional Court of the Russian Federation will announce its decision on the status of arbitration in Russia upon the Supreme Commercial Court’s request on May 26, the court told the Russian Legal Information Agency.